Max Wohlauer, a recent graduate, is now Assistant Professor of Surgery at the Medical College of Wisconsin in the Division of Vascular Surgery. He sent along a case which is published with his patient’s and department’s permission. The patient is an 80 year old man with diabetes mellitus, CHF, and pulmonary fibrosis, who presents with right foot toe ulcers. He had an inflow procedure earlier in the year, but it failed to heal the ulcers. An attempt at crossing a CTO of the SFA/POP failed. Angiogram (above), showed a distal anterior tibial artery target. Preop ABI, TBI’s, toe waveforms, and pulse Dopplers are shown. are as shown. All point to likely limb loss. The TBI is 0 and the ABI is incompressible. Max planned for bypass. The saphenous vein was mapped and shown to be adequate. The operation went well. Completion angiography was performed showing a patent bypass and distal anastomosis with good runoff. A followup duplex showed patency of the graft. Bypasses work and are possible even in high risk individuals with good anesthesia and postoperative care. Because open vascular surgical skills are not well distributed while endovascular skills are more widely distributed, there is bias both in the popular mind and even among some catheter based specialists that bypass surgery is a terrible, no good thing. The fact is that a well planned bypass is usually both effective and durable even in high risk patients, but clearly it is not the only option. Finally, I am very proud to have participated in Dr. Wohlauer’s training, and look forward to seeing his evidence, experience, and even biases, presented at future meetings. *CCF is a BEST-CLI study site. The patient is a middle aged man who after an interventional procedure was referred to my clinic with an expanding hematoma due to a pseudoaneurysm complicated by an arteriovenous fistula. He was a week out from his procedure and had grown a hematoma roughly the size of a hard boiled egg in his left groin which caused him pain. A duplex scan showed a pseudoaneurysm (below) with fistula flow. On examination, he had this well circumscribed indurated hematoma of hard boiled egg size with tenderness. There was a bruit on auscultation. Duplex showed a small chamber of flow adjacent to the proximal superficial femoral artery emptying into the femoral vein. 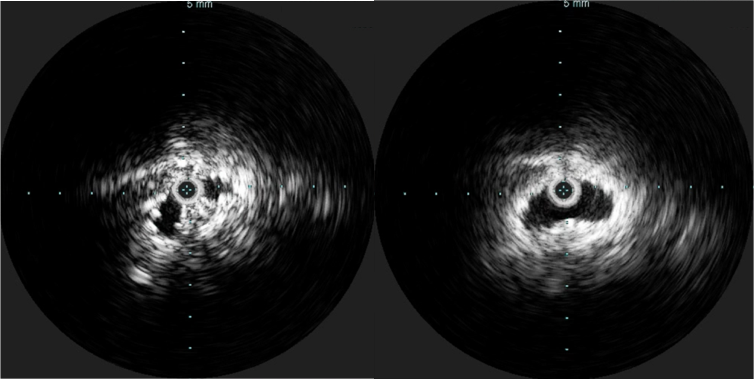 Doppler in the common femoral vein showed relatively high fistula flow, and this is reported to be associated with failure of thrombin injection. 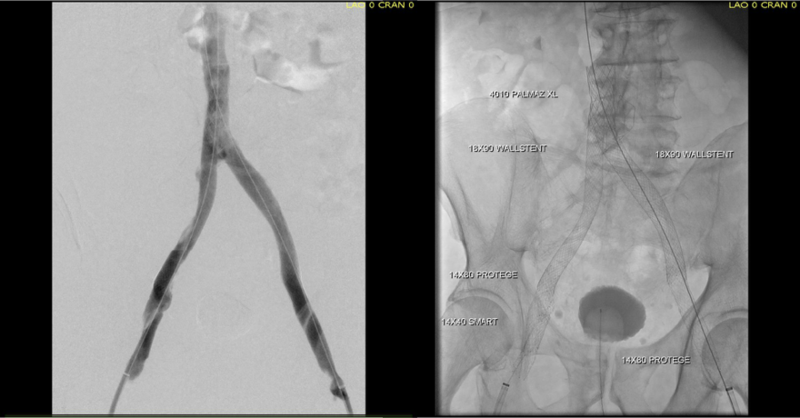 CTA (top) demonstrated flow of contrast from femoral artery to vein through a pseudoaneurysm chamber that laid between. Angulation to an axial orientation showed this better (below). Contrast flows from femoral artery (right) to the fistula chamber, then into the femoral vein. Operation was planned, but in the days leading up to the operation, I had a thought -the primary reason why ultrasound guided thrombin injection would fail is the AVF. It would be simple to fluoroscopically guide an angioplasty balloon on the arterial side to occlude the fistula inflow. The next step would be to get access to the pseudoaneurysm with a needle under ultrasound guidance, confirm location with a contrast injection. Once confirmed, the balloon is inflated and a small volume of thrombin would be injected. I discussed this with the patient in detail and he was enthusiastic about trying this before proceeding with an open repair. Arteriography showed much of the contrast from injection of the pseudoaneurysm to preferentially go to the artery which made me worry less about creating a DVT/PE. With balloon inflated (below), thrombin was injected and balloon inflation held for about 30 seconds. There was resolution of flow in the pseudoaneurysm and in the fistula. Before and after duplexes are composited below. Repeat duplex on the following day showed resolution of the pseudoaneurysm and arteriovenous fistula. In the days before ultrasound guided thrombin injection of pseudoaneurysms, open surgical repair of these was fraught with complications. First, these patients typically had cardiac disease. Second, they were usually anticoagulated often with multiple agents. And finally, they were many times obese, making not only the operation fraught with complexity, but the ultimate wound healing a delicate and rare phenomena. Even now, we get emergency repairs when access hemostasis fails, and these patients are typically high risk. With hematoma evacuation, inflammation, lymph leaks, and infections may follow; the patient was correct in his enthusiasm for agreeing to proceed with a minimally invasive effort. As to the techniques, they are all well established in the vascular surgeon’s toolbox. Ultrasound guided access of the pseudoaneursm should be obtained before arterial occlusion. This was facilitated by general anesthesia which kept the patient from moving. Having access to excellent ultrasound and angiographic imaging made this possible. The patient felt much better and was discharged home the next day after his confirmatory duplex.